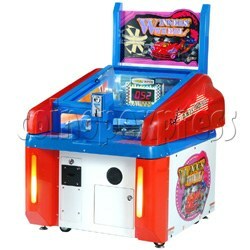 This machine features with a skill test game play by a chance to release a ball dropping down into each one of the scores hole to win extra bonus tickets. - the object is to hit the revolving chute, push the coin into the win slot. this releases a ball, which rolls into one of nine holes of different values rewards to player. - two skill challenging is that player must first hit one of nine chutes. then, they should hit the particular chute, which will give the best chance for the ball to enter a high value numbered or bonus hole. - player must hit the target and win a pre-established number of tickets for prizes.